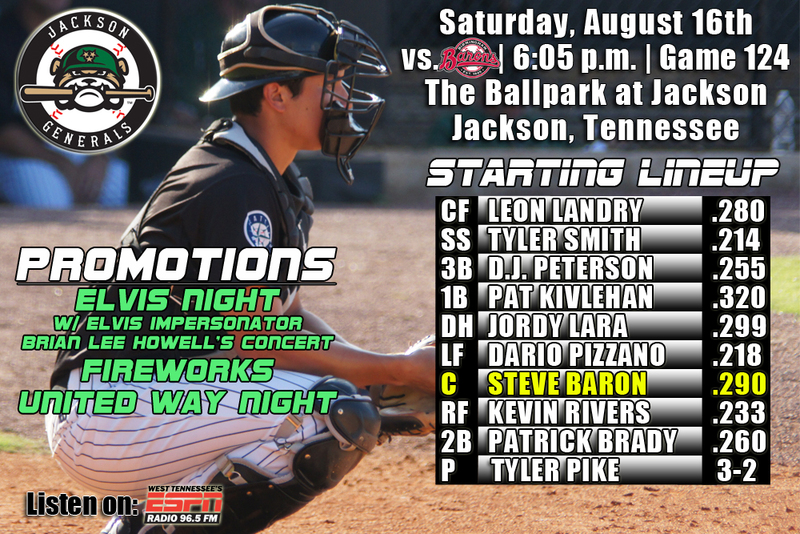 • The Generals continue a 5-game road series at Huntsville (1-2) with game 4 of the set…this is Jackson’s 5th and final series with Huntsville this season and are 12-11 overall against the Stars and 5-8 at Joe Davis Stadium. • 3B D.J. Peterson hit 2 home runs and drove in 4 runs as Jackson defeated Huntsville 6-2 in game 1 of a doubleheader on Tuesday. • Peterson (2×4, 2 R, 2 HR, 4 RBI) recorded his 4th career multi-home run game, but first with Jackson (last: 5/23/14 at Bakersfield w/High Desert). He hit a 1-out, 2-run home run in the 3rd inning and 2-out, 2-run blast in the 4th inning. CF Patrick Kivlehan (2×4, R) recorded the team’s only other multi-hit effort, while RF Jabari Blash (1×3, R, HR, RBI, BB) and LF Dan Paolini (1×2, RBI, BB) each drove in 1 of the Generals 6 runs. • Starter Tyler Olson (5.1,7,2,2,0,4,HR) earned his 8th win of the season, allowing 2 runs on 7 hits over 5.1 innings. RH Trevor Miller (1.2,1,0,0,2,0,WP) picked up his 3rd save of the season, allwong only 1 hits and 2 walks over 1.2 scoreless innings. • In the nightcap, DH D.J. Peterson drove in the Generals runs as Jackson lost to Huntsville 1-2 in 8.0 innings. Peterson (2×3, RBI) led the team with 2 hits, while CF Leon Landry (1×3, R, 3B) and 1B Jordy Lara (1×3, 2B) each had 1 of the Generals 4 hits. • Final Trip to Huntsville for Jackson – With the Huntsville franchise moving to a brand new ballpark in Biloxi, MS for 2015, this is the Jackson franchises final trip to Joe Davis Stadium. 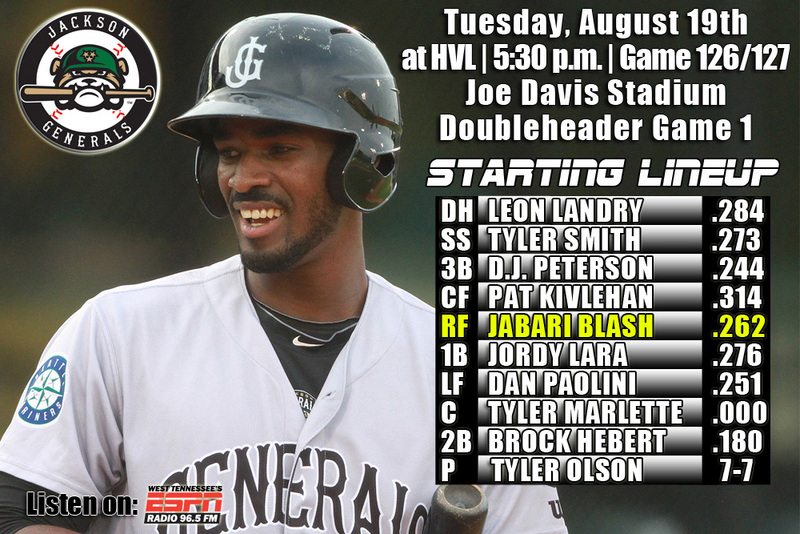 • The Generals are 12-11 against Huntsville this season and are batting .279 with 18 home runs. The Stars are batting .256 against Jackson and the Generals have out-scored the Stars 110-94 in the 23 games. 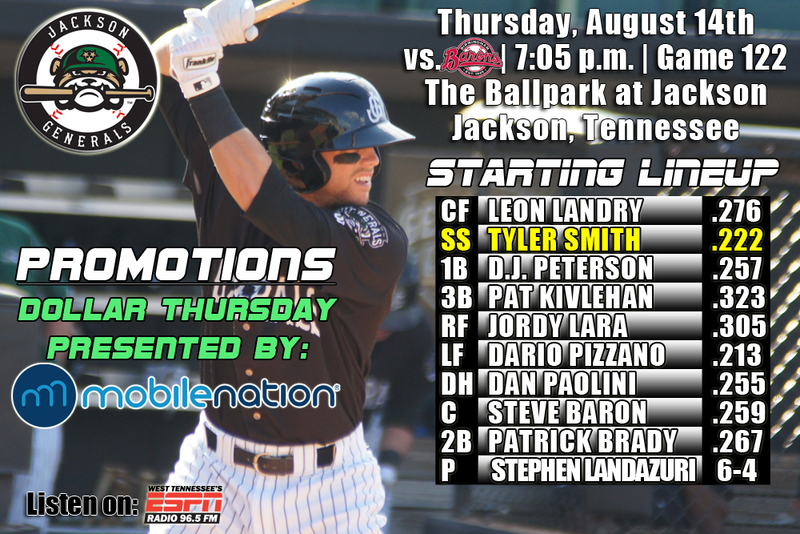 • Homer Happy Generals – After blasting 6 home runs in the first 3 games of the series at Huntsville, Jackson has 40 home runs over their last 46 games since July 1st, ranking T-1st in the SL. Birmingham is tied with Jackson. • The Generals are in the midst of playing 21 games in 21 days to close the season (4-5) including 5 more home games against Chattanooga (8/22-8/26) with current road trip to Huntsville and Montgomery. 6 of the final 11 games are against North Division foes. Jackson is 33-31 against their remaining opponents. • Olson gets the win in game 1 on Tuesday – Over his last 4 starts in August, LH Tyler Olson is 3-1 with a 1.09 ERA (3 ER, 24.2 IP). During this stretch he has limited opponents to a .223 (21×94) average, while walking 4 and striking out 20. After going 3-5 with a 4.56 ERA (36 ER, 71.0 IP) over his first 13 AA starts, Olson is 5-2 with a 2.41 ERA (11 ER, 41.0 IP) over his last 7 starts. • LH Kyle Hunter has not allowed a run over his last 19.2 innings (11G/1GS). During this stretch, since July 16, Hunter has limited opponents to a .191 (13×68) average, while walking 5 and striking 11. • RH Trevor Miller has not allowed an earned run in his last 201 IP over 8 relief app. During this stretch, since July 24, he has limited opponents to a .191 (13×68) AVG, while walking 4 and striking out 17. • OF Dario Pizzano has a hit in 5 of his last 6 games batting .368 (7×19), with 4 doubles, 1 home run and 5 RBI. • OF Leon Landry has recorded a hit in 9 of his last 11 games, batting .302 (13×43) with 8 runs scored, 2 doubles, 3 triples, 1 home run, 1 RBI, 1 walk and 1 stolen base. • INF Patrick Kivlehan has hit safely in 9 of his last 11 games, batting .326 (14×43) with 9 runs scored, 4 doubles, 1 triple, 2 home runs, 8 RBI and 2 walks. 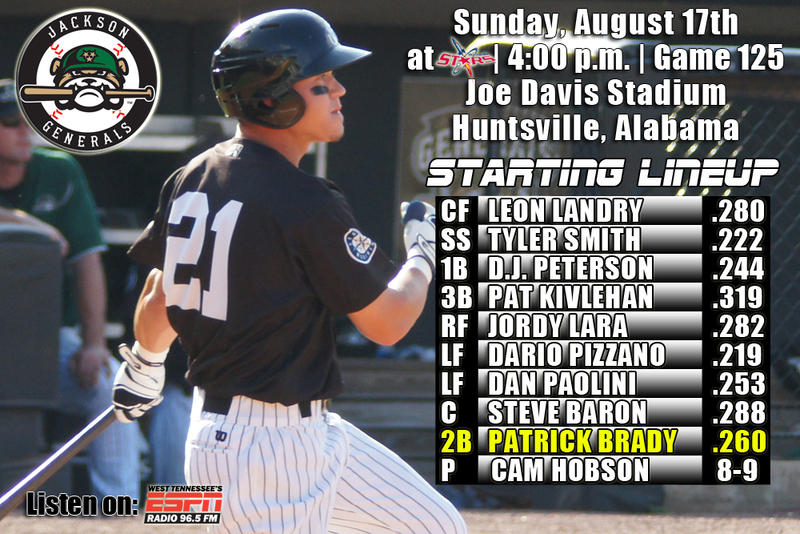 • The Generals look to stop a 4-game losing streak with a doubleheader which includes game 2 and 3 of the 5-game road series at Huntsville (0-1)…this is Jackson’s 5th and final series with Huntsville this season and are 11-9 overall against the Stars and 4-7 at Joe Davis Stadium. • On Monday, the Generals and Stars were postponed due to inclement weather and heavy rains in Huntsville. • After 3 home runs on Sunday, Jackson currently has a league-leading 18 homers in the month of August and despite ranking 7th with 79 on the season, they rank T-1st with Birmingham, blasting 39 long balls since July 1st. • In the Southern Leagu, rain outs become quite common, but for Jackson this was the first rain out since July 14th at home against Birmingham and 5th on the season. • The Generals have been washed out just 3 times at home this season which is T-2nd fewest in the league this season. • YOU (MAY) ALREADY KNOW that C Tyler Marlette was promoted from High Desert on Monday, but DID YOU KNOW? that he will be the 53rd player to wear a Generals uniform this season. The most since 2010 when 56 players played for Jackson. • The Generals are 11-10 against Huntsville this season and are batting .283 with 15 home runs. The Stars are batting .256 against Jackson and the Generals have out-scored the Stars 103-90 in the 21 games. • The Generals are in the midst of playing 21 games in 21 days to close the season (3-4) including 5 more home games against Chattanooga (8/22-8/26) with road trips to Huntsville and Montgomery. 8 of the final 13 games are against North Division foes. Jackson is 32-30 against their remaining opponents. • OF Dario Pizzano currently has a 5-game hit streak, batting .400 (8×20) with 3 runs 4 doubles, 1 home run, 6 RBI and 5 walks. • OF Leon Landry has recorded a hit in each of his last 8 games, batting .333 (12×36) with 7 runs scored, 2 doubles, 2 triple, 1 home run, 1 RBI, 1 walk and 1 stolen base. • INF Patrick Kivlehan has hit safely in 13 of his last 15 games, batting .333 (19×57) with 12 runs scored, 4 doubles, 1 triple, 2 home runs, 10 RBI, 6 walks and 3 stolen bases. • Overall this season, Patrick Klvlehan, Jordy Lara and D.J. Peterson have put up impressive numbers. Here is how they rank in all of MiLB and the Seattle Mariners organization. Lara currently is T-1st in all of MiLB in hits with 162 this season. These numbers for each player are between High Desert and Jackson. 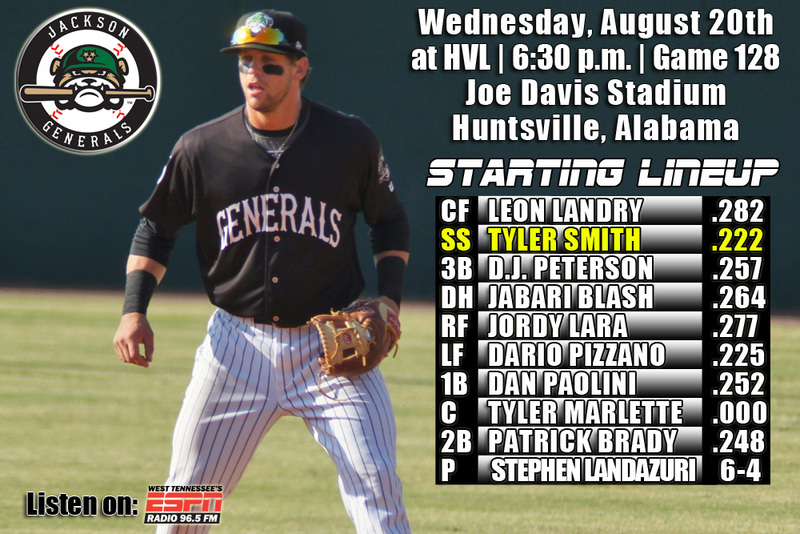 • The Generals look to stop a 4-game losing streak with game 2 of a 5-game road series at Huntsville (0-1)…this is Jackson’s 5th and final series with Huntsville this season and are 11-9 overall against the Stars and 4-7 at Joe Davis Stadium. • DH Dario Pizzano (solo), SS Tyler Smith (2-run) and RF Jordy Lara (3-run) each homered as part of a 6-run 3rd inning, but it wasn’t enough as the Stars scored 8 unanswered runs as Jackson fell to Huntsville 8-6 on Sunday. • Pizzano (3×4, R, 3B, HR, RBI) and CF Leon Landry (3×5, R, 3B) each led the team with 3 hits, while Smith 92×4, R, HR, 2 RBI, BB) recorded the Generals only other multi-hit game. Lara (1×5, R, HR, 3 RBI) recorded his 16th RBI. • Starter Cam Hobson (5.2,5,3,2,1,4,HR) allowed 3 runs (2 ER) on 5 hits over 5.2 innings, but did not factor into the decision. RH Stephen Shackleford (1.0,2,1,1,1,0), LH Nick Hill (0.2,2,2,2,0,1) and RH Mayckol Guaipe (0.2,2,2,2,0,0,HR) combined to allow 6 runs (5 ER) over 2.1 innings in relief. Guaipe recorded his 3rd loss of the season, after being charged with 2 runs as part of a 4-run 8th inning. 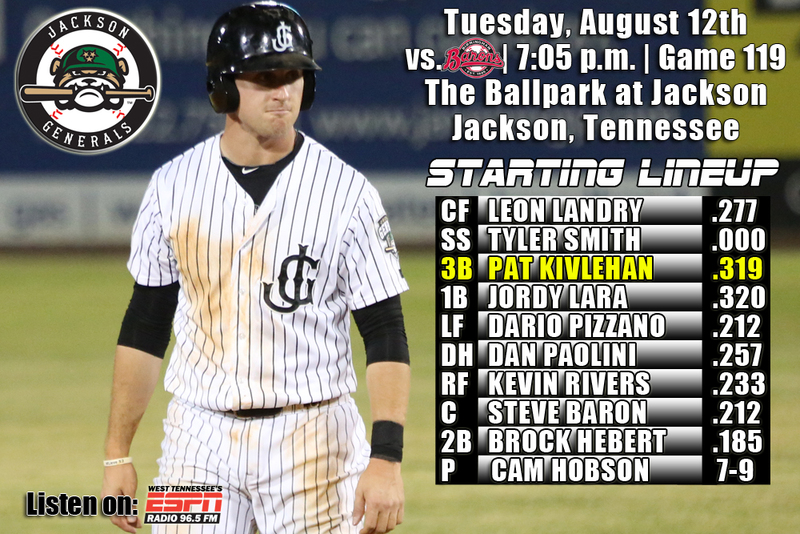 • The Generals begin a 5-game road series tonight with game 1 of the set at Joe Davis Stadium…this is Jackson’s 5th and final series with Huntsville and are 11-9 overall against the Stars and 4-6 at Huntsville. • The Generals rallied for 3 runs in the bottom of the 9th inning, including a 2-run double by 1B Patrick Kivlehan, but it wasn’t enough as Jackson fell to Birmingham 5-6 on Saturday night. • Kivlehan (1×4, R, 2B, 2 RBI) led the team with 2 RBI, while SS Tyler Smith (1×4, 2B, RBI), LF Dario Pizzano (1×4, 2B, RBI) and 2B Patrick Brady (1×3, R, HR, RBI) each drove in 1 of the team’s 5 runs. 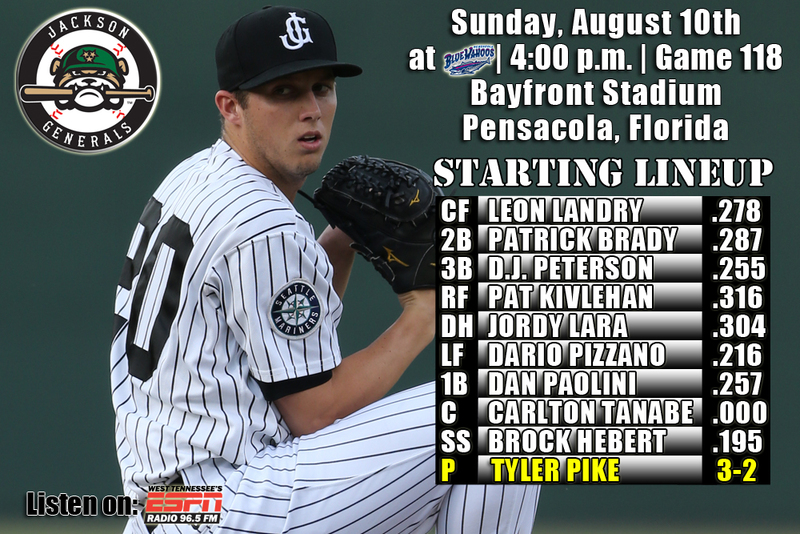 • Starter Tyler Pike (5.0,8,5,5,2,0,HR) recorded his 3rd loss, allowing 5 runs on 8 hits over 5.0 innings. RH Matt Brazis (3.0,2,1,1,0,3) allowed 1 run 7th inning, while LH Kyle Hunter (1.0,1,0,0,0,2) allowed 1 hit and struck out 2 in a scoreless 9th inning. 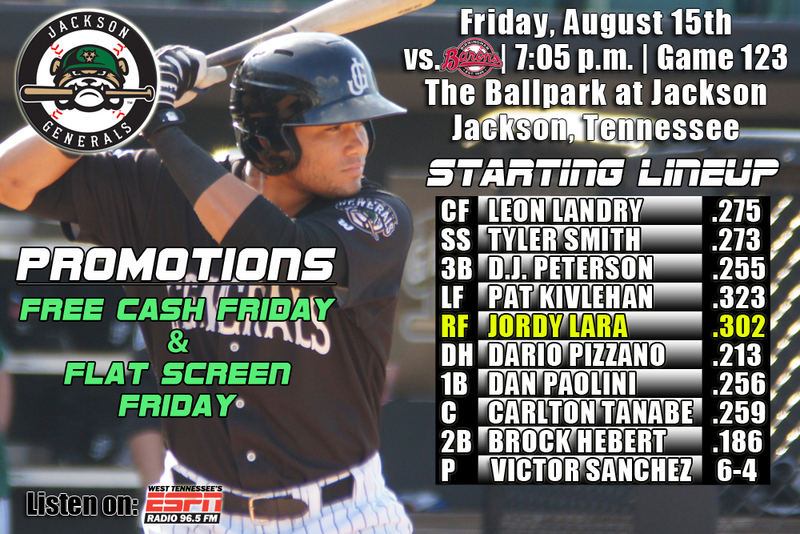 • Jordy Lara currently has 161 hits this season between High Desert and Jackson, which leads all of the minors…Wilmer Difo of the HagerstownTigers is 2nd with 159…Lara also ranks T-5th in the minors in extra-base hits (62) and 11th in OPS (.987). • The Generals are in the midst of playing 21 games in 21 days to close the season (3-3) including 6 more home games (BIR, CHA) with road trips to Huntsville and Montgomery. 11 of the final 16 games are against North Division foes. Jackson is 32-28 against their remaining opponents. • INF/OF Patrick Kivlehan currently ranks 1st in the Southern League in batting (.319) and 3rd in slugging percentage (.524). Kivlehan also ranks 4th in the M’s organization in average (.308), 4th in HR (19) and 2nd in RBI (95) between Jackson and High Desert. Kivlehan ranks T-2nd in all of MiLB having played in 122 games this season. He ranks 4th in the minors in RBIs with 95. • YOU ALREADY KNEW that the Generals wrap up their season series with Huntsville today, but DID YOU KNOW? 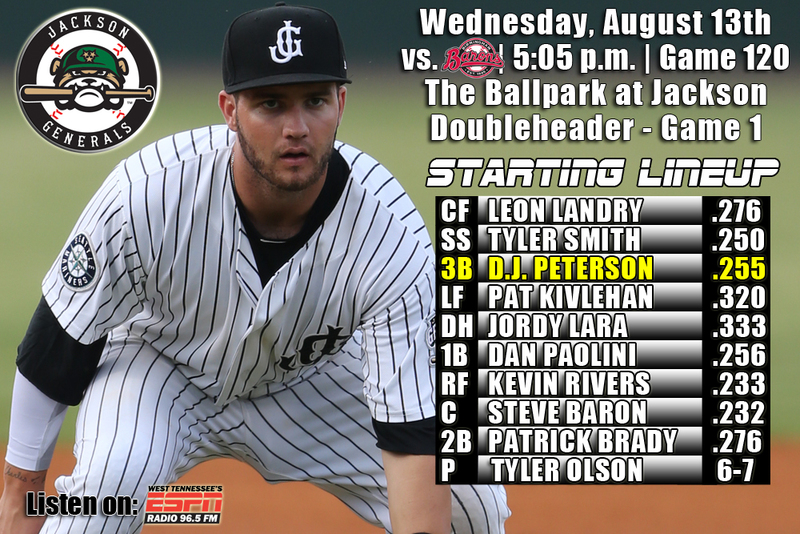 that Jackson plays Huntsville 25 times this season which is the most against any Southern League team. • Getting it done on the mound – Jackson is 8-6 in August and posted a 3.09 ERA. • C Steve Baron has hit safely in 7 straight games, including 4 of last 5 being multi-hit efforts, batting .462 (12×26) with 2 runs, 3 doubles, 3 RBI and a stolen base. He has upped his average from .175 to .288. • INF Patrick Kivlehan currently has an 8-game hit steak, batting .387 (12×31) with 7 runs scored, 4 doubles, 1 triple, 1 home run, 8 RBI and 2 walks. He has also hit safely in 13 of his last 14 games, batting .365 (19×52) with 11 runs scored, 4 doubles, 1 triple, 2 home runs, 10 RBI, 6 walks and 3 stolen bases.